China manipulate the value of their currency, the Yuan. This is good for tourists as it makes it cheaper for us to visit, hotels in Beijing are very good value for money. Beijing is huge so choose a hotel close to the points of interest you want to visit, you may consider a hotel close to Tiananmen Square and the Imperial City. If you are visiting Beijing for the first time, then you’ll want to photograph the Gate of Heavenly Peace (above). There are several points of interest within walking distance of the gate. On one side of the Gate of Heavenly Peace is the Forbidden City and on the other side is Tiananmen Square. If you stay in a hotel near the gate then it’s unlikely you’ll need to use public transport during your stay (only to the airport or train station). The metro in Beijing is very easy to use, taxis use their meters and are good value too. One point of interest which is worth getting on the metro to go and see is the National Stadium, known as the Bird’s Nest. The Bird’s Nest was made famous whilst hosting the Beijing Olympics. There are daily stadium tours, if you aren’t interested in a tour then the exterior of the stadium still makes very Instagrammable images. Every morning and evening in on Tiananmen Square there is a changing of the guard ceremony which involves guards marching and the flag being raised / lowered. The best time to watch the changing of the guard is in the morning as there are fewer people. There is a famous song called 9 million bicycles by Katie Melua which a lot of people think of when you mention Beijing. However, after visiting Beijing I didn’t notice a huge amount of bicycles! 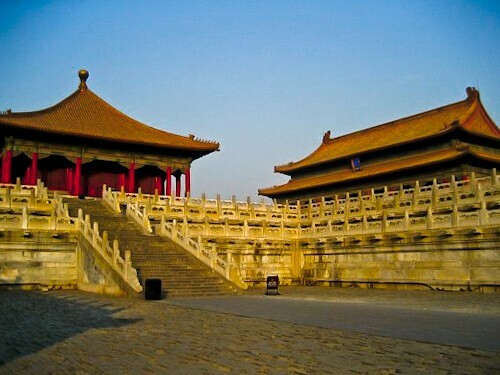 After walking through the Meridian Gate you will enter the Forbidden City. The Forbidden City was the Imperial Palace used by the Dynasties of China from 1420 to 1912. It is a UNESCO world heritage site and contains the most amount of preserved wooden structures in the world, over 980 in total. I would recommend visiting the Forbidden City early to avoid huge crowds (above). Which museum is the most visited museum in the world? The answer is The Palace Museum, located inside the Forbidden City. It makes sense that the most visited museum in the world is located in the center of the capital city of the most populated country in the world. You’ll see statues of the former leader of China, Mao Zedong, everywhere in China, he’s even the face on the Chinese money, the Yuan. 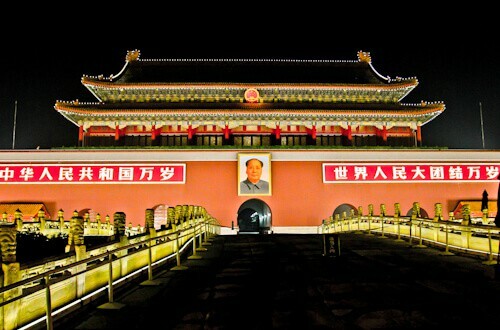 You can visit the preserved body of Mao Zedong in the mausoleum situated in Tiananmen Square. This building is officially called the Chairman Mao Memorial Hall but it more commonly referred to as the Mausoleum of Mao Zedong. There are no photos allowed in the building and I wouldn’t risk sneaking a photo as there are lots of guards and the Chinese are quite strict. If you want bragging rights to having seen the real Mao Zedong then you must visit the mausoleum. Beijing is polluted, I was there for 2 nights and had a sore throat from the dirty air. You can see the pollution in the air (above), if you are sensitive to pollution you may consider wearing a pollution mask which they sell in most convenience stores. There are many places in Beijing offering tours to the Great Wall, the touristy part of the wall is found in Badaling or Mutianyu. If you go to Badaling or Mutianyu I recommend taking an early tour so it’s not so busy. 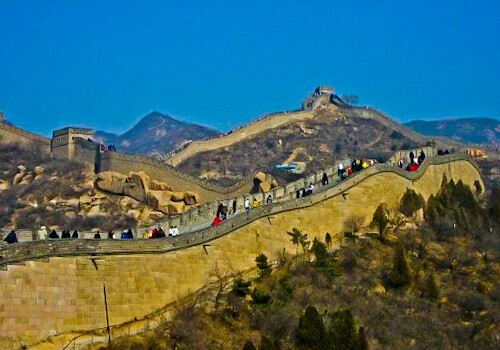 It is said that the Mutianyu is better preserved than the Badaling section of the wall. For those who want to visit a quieter area of the wall I recommend finding a tour to the Jiankou section. The train from Beijing to Xi’an is an overnight service. I traveled in second class and the train had 6 berths per open cabin, not many foreigners travel by train so the Chinese are curious and will want to meet and talk to you. There will be a few who can speak English who will probably become your translator on the journey. Since my visit a new high speed rail link has opened between Beijing West Railway Station and Xi’an which makes the 1200 km journey take less than 5 hours so it looks like this overnight journey I took is a thing of the past in China. I found the easiest way to buy a train ticket is either online (for a small fee) or there are many shops and hotels in Beijing who will buy your ticket for you for a small fee. I don’t advise going to the train station to buy your ticket as it is very difficult with the language barrier, the size of the train station and the number of people there. The amount you pay in transit to and from the train station will probably cost more than the service fee if you buy online or from a hotel anyway. I went to Beijing 5 years ago and I also felt a bit sick from all the pollution. I was surprised how neglected the Bird’s Nest seemed. But, the Great Wall was fabulous! I wish we had spent longer there so we could have walked a bit further. It’s quite a strenuous walk! I also didn’t notice very many bicycles. I saw many more in Zhu Jai! I love how you always set up your posts with the bullet points first! So helpful, especially if you’re on the go. I’d love to walk some of the Great Wall of China – it’s on my list! Beijing always fascinated me, as whole China does. 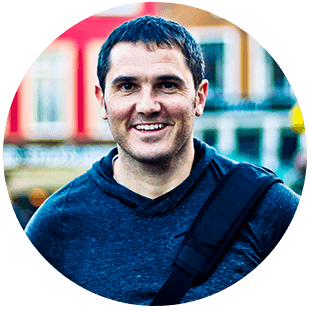 And as always – many great, interesting and helpful tips! My all time favourites would be definitely the Forbidden City and of course the Great Wall – and yes I can imagine how crowded these places are already if you are not super early in the morning there. Would have loved to see more photo impressions from your Beijing trip. My partner has been to Beijing and visited many of the key places you have highlighted here. This post makes me want to go even more and see it for myself. 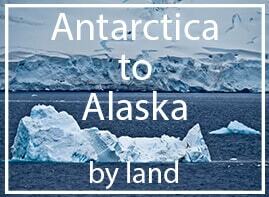 Great tips about visiting early to avoid the crowds and also cope with the pollution. Lovely photos too. Sounds like the best time to play tourist is first thing in the morning. I’m surprised that there wherent more bikes around. I always giggle with I see the Birds Neet and remember how they faked the fire works for the Olympic opening ceremony due to the smog. I’ve been waiting to go to China for some time now and with Disney opening there it looks like that will happen sooner than later. My sister has been there and she told me it gets really crowded so yeah mornings might be the best time to see it all. And The Great Wall is just one of those places in the world that one has to see. The Great Wall of China is something I want to see once in my lifetime. Not sure when I will make to Beijing and China. 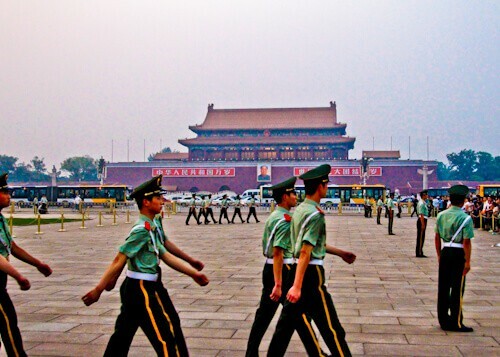 Tiananmen Square and the Gate of Heavenly Peace look fantastic, as does the Forbidden City. 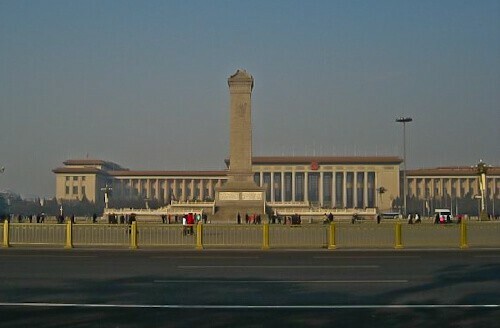 Gate of Heavenly Peace, Tiananmen Square, Beijing look grand and majestic. Great Wall of China pictures are beautiful and I am so curious to go there right now. You have given a perfect itinerary for Beijing. will plan soon. wow I can’t believe the pollution affected you that quickly in Beijing, China. I’ve heard the pollution in Beijing is bad but that’s pretty serious. Still, Tiananmen Square and the Forbidden City look amazing! Shanghai blew me away along with some other parts of China. But I have yet to visit Beijing. Reading this post has opened my eyes to many points of interest in this city. I should definitely book a return trip soon! Woah what an incredible adventure! Beijing is an interesting city to visit, I won’t ever forget my time there. There’s a lot of great information here, thanks! I especially like the tip about going to the Jiankou section of the Great Wall for a quieter visit. I’ve always wanted to visit the wall, but have had fears of it being like those terrible wall-to-wall people pictures I’ve seen from time to time. Happy Travels! Great wall of china is high on my list. But after reading your post list getting longer…it seems i will have to spend some more days in China. We did an 18 day private tour of China so were a little spoilt as we flew between the major cities, so this piece is most helpful for when we return. The Great Wall was obviously a huge highlight for us, we visited the Mutianyu section and yes, it is remarkably preserved and we felt there were hardly any tourists compared to what we thought we would encounter; some photos we managed to take without anyone at all in them, and we visited in high season (August) on a weekend 😀 China is a wonderful country to visit isn’t it? 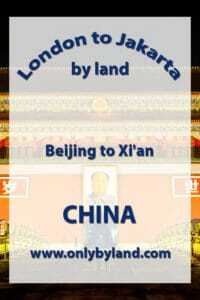 Mainland China, Beijing and Xi’an have always been on my travel list. This post just made me wanna fast forward my trip China to be happening real soon. I like the way information is so concisely and crisply summarise in this post. China’s Forbidden City and Great Wall are certainly on my travel list. Will have to ensure we plan so that we can avoid those crowds that you mention. There are beautiful Chinese architecture and colors on the outskirts of the Forbidden city. I have seen photos of the buildings inside Forbidden City. They are really old but they still look majestic. I would love to visit the Great Wall and the Forbidden City someday. You had my attention with the Gate of Heavenly Peace, but the photo of the great wall is amazing. China is one of those places I know so little about, but your post has really given me a taste for the place. Thank you for sharing. Beijing seems to be one of those cities that draws you in and pushes you away at the same time. The smog and crowds are definitely a lot to contend with, but then there’s the allure of the Forbidden City, and so many museums and temples. Between the push and the pull, Beijing – and China in general – seems stuck midway down our Bucket List. But it’s fantastic to read about it! We lived in Beijing for 2 years and this post has brought back many fond memories. The Temple of Heaven and the huge park that it’s in is also a worthwhile visit. Many Chinese play mahjong and dance in the grounds. The Great Wall Marathon has just been on and a friend of mine participated. It’s along the top of the wall. Crazy stuff! 😉 Cool post, James. It makes me want to go back. I haven’t been to Beijing since right before the 2008 Olympics and your post brought back so many memories. The pollution is a serious issue still to this day, despite efforts to make it better. I think China’s headed in the right direction with climate control though and I’m confident one day the country will have beautiful blue skies like the rest of the world. Oh this brings me back! I visited Beijing for my 21st Birthday. That was quite some time ago now but it doesn’t seem like much has changed! Xi’an is on our bucket list. Had never read about anyone doing this journey by train. Was the second class comfortable? Thank you for the tips. I was in BJ every summer at the universities and have not been back there in years. I remember visiting the Bird’s Nest at night with the blue lights glowing and it is really beautiful and surreal. The air quality was not that bad when I was there and I really love to the streets alongside the Tiananmen Square. Your post brings back so many memories and hope you enjoyed your time there.